Most Excellent Alan C. Lewis was raised December 2, 1957 in Star Lodge #670 in Petersburg, NY. Alan and his wife Shirley celebrated 53 years of marriage on September 1, 2009, the proud parents of three daughters and blessed with seven grandchildren and one great-grandchild. Shirley and Alan were members of the Delmar Methodist Church in Delmar, NY. Alan spent three years in the US Navy as an Electronics Technician. Upon discharge he attended Albany State Teachers College in Albany, NY where he earned his BS and MS degrees. While in college Alan became employed by the New York State Teachers Association (which in 1972 became the New York State United Teachers) and retired in February 1997 as Legislative Re- lations Coordinator after 40 years of service. Alan was a member of Van Rensselaer Star Lodge #400 in Hoosick, NY and Bethlehem Lodge #85 in Delmar, NY. 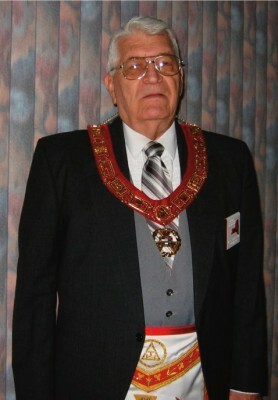 He has been Master four times and secretary for a total of 15 years, was Grand Representative of Alberta, Canada 1969-72 and has served on several Grand Lodge Committees. Alan was Ritual Chairman for Bethlehem Lodge and enjoyed taking part in the degrees. Alan was exalted in Temple Chapter #5 in Delmar in 1967, which is now part of Ancient Temple Chapter #5 in Albany, subsequently serving as High Priest (three times), AGL, and DDGHP. He was appointed Grand Master of the First Veil in 1999, Grand Royal Arch Captain in 2004 and served as the Grand High Priest of the Grand Chapter, State of New York, Royal Arch Masons. Alan was a member and past presiding officer of Bloss-DeWitt Clinton Council #14, Cryptic Masons; Capital City Commandery #2, Knights Templar; Albany York Rite College #24; Glencairn Council #14, Knight Masons; Trin- ity Priory #5, Knights of the York Cross of Honour; and Albany Conclave, Red Cross of Constantine, all of Albany. He was a member and officer of Albany Tabernacle #24, Holy Royal Arch Knight Templar Priests. Alan has been honored by being named Cryptic Mason of the Year in 2001, awarded the Order of the Purple Cross in 2005 and Knight Commander of the Temple in 2006. He has also presided over three Scottish Rite bodies in the Valley of Albany, and was Coroneted 33 degree in 1994. Alan was also a member of Palestine Chapter #167 and Van Rensselaer Star Chapter #256, Order of the Eastern Star, and in 1978 he served as Grand Patron of the Grand Chapter of New York. Alan was also an advisor for Empire Chapter of DeMolay (his grandson the Master Counselor) and has been an advisory member of the State Board of Directors of Constellation since 1978. Alan also served as a member of the Board of Directors of the Bethlehem Senior Projects, Inc., a not-for-profit 501(c)(3) corporation guided by a board of community volunteers which partners with the Town of Bethle- hem to supplement services within the community. Over twenty programs and services are made possible through Bethlehem Senior Services and Bethlehem Senior Projects, Inc. including the funding and operation of the Bethlehem Senior Transportation Service, the Bethlehem Food Pantry and the Community Loan Closet, all of which benefit elderly and/or low-income residents. In what little spare time he had, Alan enjoyed playing golf and driving a van or car for the Senior Services program of the Town of Bethlehem.